If you have a rental car, you have much more control over how long you spend at each place and sometimes, even where you have access to. Personally, I think this is the best option; however, it is also a more expensive option. The Bus, the name of Hawaii’s bus system, is actually quite good. For only $5.50/day, you can get on and off of The Bus an unlimited number of times. It surprisingly can get you quite close to many North Shore landmarks. While I don’t recommend this option as it is extremely cost inefficient to get to or around the North Shore, it is an option. Because the North Shore has resisted tourism and development for so long, there aren’t that many places to stay. So take your pick! This resort is the local-pick for where to stay on the North Shore. 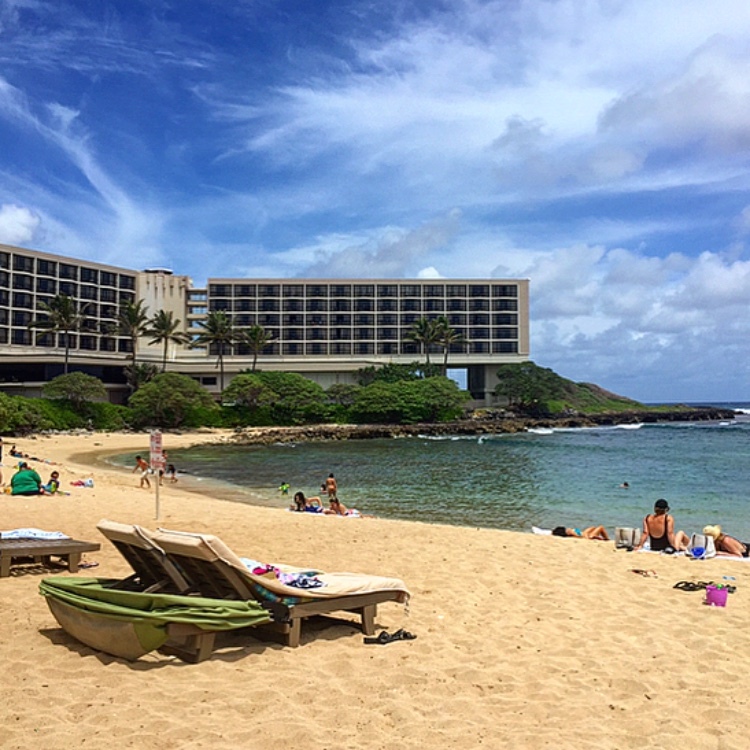 Whenever locals want to feel like they’re on vacation, they go to the North Shore and stay at Turtle Bay Resort. With tons of amenities and activities, including a fitness center, a spa, and a golf course, there is a ton to do! Room rates start at $288 per night, although this price does depend on the season. The Courtyard by Marriott is located in Laie, a patch of the mainland vibes in the middle of very local island vibes. The amenities include both a fitness center and a pool. Room rates start at $218 per night, although this price does depend on the season. The Backpackers Vacation Inn and Plantation Village is a budget hostel on the North Shore, Oahu. While not packed with amenities (as to be expected), it is quite close to many recommendations on this list, including Three Tables Beach and Waimea Bay. Room rates start at $60 per person per night, although this price does depend on the season. There are tons of Airbnbs on the North Shore of Oahu, ranging from $25 per night to $1,755 per night. Need help picking the best choice from these hundreds of options? Here are six steps to get you on the right track. The Dole Plantation is a must-stop for a Dole Whip. (That’s why I put it on Part 1 of the Hawaii Food Bucket List.) 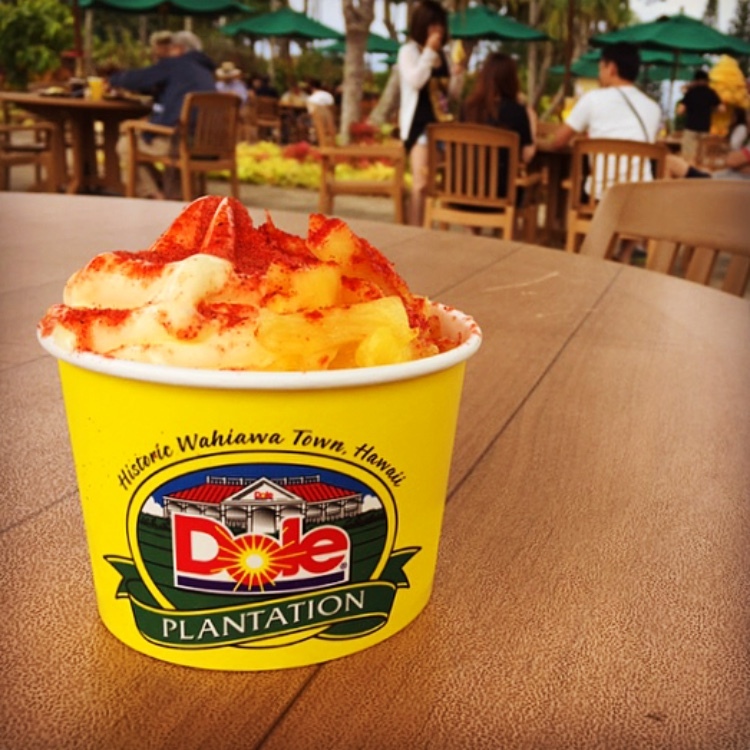 Even if you’ve tried it at Disneyland or your local ice cream place, you need to try it at the Dole Plantation, because it’s just SO much better. There are even chunks of pineapple lining the bowl! Haleiwa Joe’s is one of the only sit-down restaurants on this list. Regular visitors to this restaurant usually recommend seafood dishes or the prime rib. If you’re looking for a place to try some as-traditional-as-it-can-get-without-being-cooked-in-the-ground kalua pig, Kono’s is the place for you. The entire menu seems to be centered around kalua pig, as they serve everything from kalua pig breakfast burritos to kalua pig sliders to kalua pig salads. Tip: If you happen to have a tattoo of a surfing pig, you can get 25% every time you eat at Kono’s. I’ve written about Kahuku Farms many times before, including on Part 2 of the Hawaii Food Bucket List. I still stand by my recommendation, as the acai bowls are unique and delicious! If acai bowls aren’t your thing, they also have a great selection of smoothies and a farm-fresh menu. Tip: If they’re selling lilikoi (passion fruit) butter mochi that day, try at least one. I was hesitant to put two acai bowl places on this list, but I decided it was acceptable because Haleiwa Bowls and Kahuku Farms are on two opposite ends of the North Shore, Oahu. Haleiwa Bowls reminds me of the acai bowls that I get on the mainland (that’s what we called the continental U.S. – check out this post for more local words to know). That’s not at all a bad thing; as a matter of fact, one of my favorite acai bowl places is in Southern California. 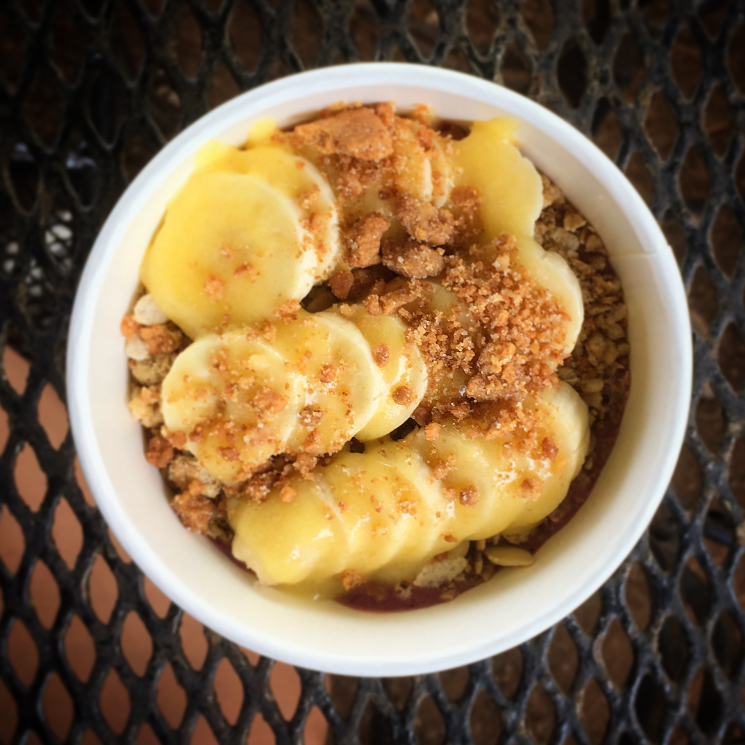 So if you’re looking for more of a traditional acai bowl, Haleiwa Bowls is the place for you. Looking for a place to grab a delicious burger or sandwich? Head to Kua Aina! With everything from a mahi mahi sandwich to a traditional juicy cheeseburger to an avocado burger with an actual half an avocado in it, Kua Aina has something for everyone. 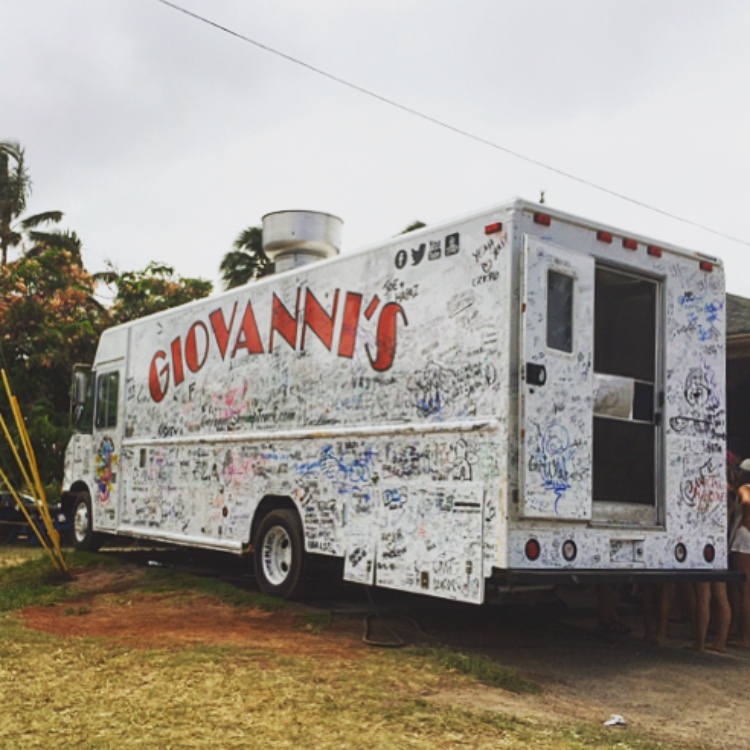 Giovanni’s Shrimp Truck has also made it onto this blog a couple of times, because its garlic shrimp is so good! Don’t let anyone talk you into going to another North Shore shrimp truck instead, because it’s just not the same. And guess what?! It’s so good, it’s one of only ten food establishments to make it onto my Best Oahu Restaurants list! There are many, many beaches on the North Shore, far too many to try to cover in this guide. In addition, where to go to the beach on the North Shore entirely depends upon what you want to do while you are at the beach. So instead of listing all of the beaches on the North Shore, I’m just going to list the best in each category. 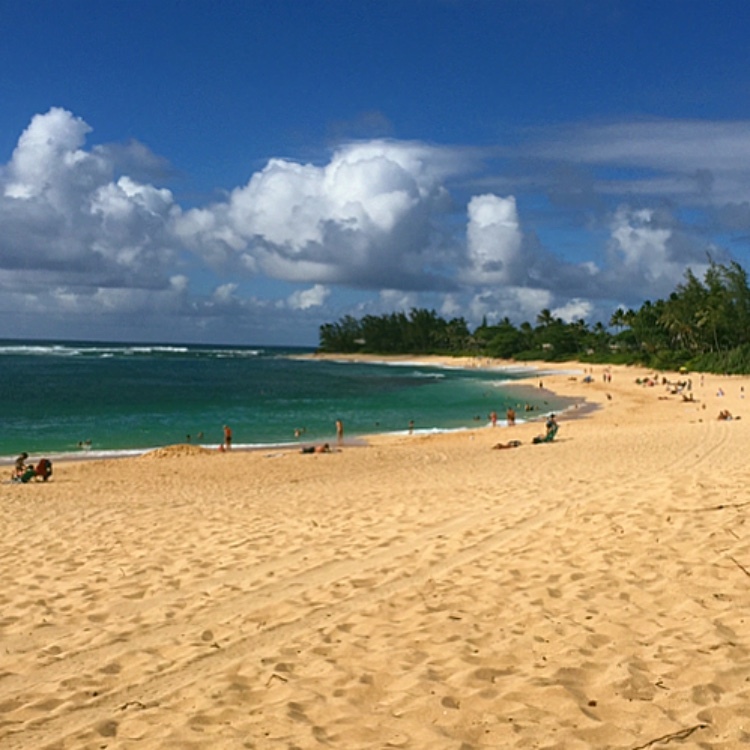 Finding a beach on the North Shore, Oahu without strong waves or current is quite difficult. 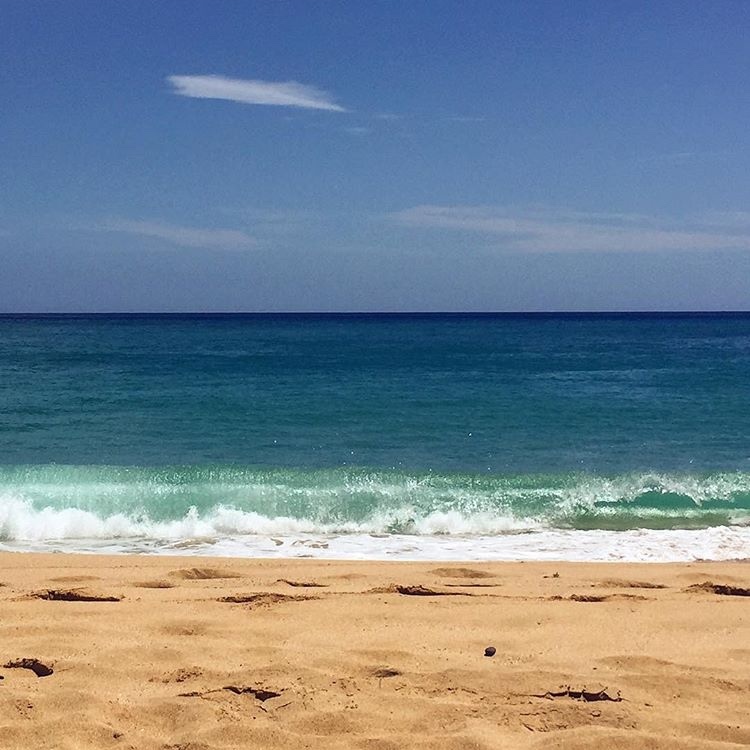 Waimea Bay may be one of the only spots where you can casually swim around. Pipeline is the world-renowned place to surf. It’s large waves and close shore break make it the perfect place to host surfing competition, like the annual Billabong Pipe Masters. Be warned though, do not surf here unless you are a pro. As a matter of fact, don’t surf anywhere on the North Shore, Oahu unless you are a pro. Pipeline is also known to be the deadliest surf break in the world, so don’t get too overconfident. Sunset beach has a decent amount of space to just lay out and enjoy the sun. Plus, because the sand is slanted downwards, it’s a little more difficult for the tide to rise up to the higher portions of the beach (unlike other, less-slanted beaches). Everyone brags about Hanauma Bay on the East side – and once upon a time, it was amazing and filled with fish. Now, Three Tables is where it’s at. Casually snorkel around and find schools of colorful fish! 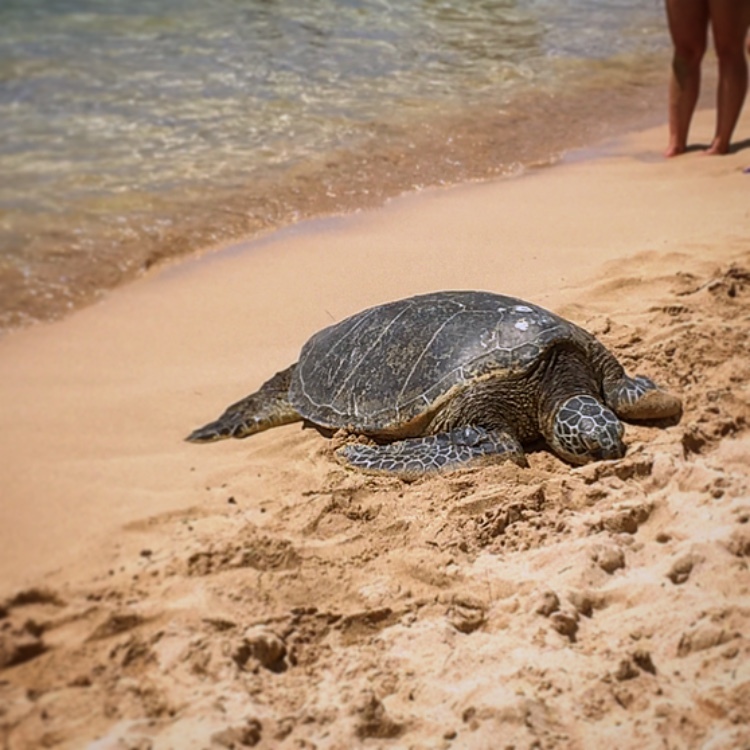 Maybe if you’re lucky you’ll be able to spot a honu (Hawaiian green sea turtle). *Note: do not pass the three “tables” (the circular flat islands) at this beach. If you do, the current will become significantly stronger and you may be pulled out to see before you even realize it. The most popular and the safest place to go cliff-jumping on Oahu is at Waimea Bay. The large rock on the left side of the bay is tall enough to give you a little thrill but short enough that it won’t hurt when you hit the water. Looking for another place to spot some honu? Catch them casually laying around on the shoreline of Laniakea Beach. I think I’ve only been to this beach maybe twice when there weren’t any turtles, so your odds are pretty good. Stand-up paddle boarding in Haleiwa Harbor is so much fun! Because it is a harbor and not open ocean, there’s not as much of a current to fight against. Plus, there’s a little river for you to wander down and explore. Tip: If you’re looking for places to rent stand-up paddle boarding gear, there are many vans in the Haleiwa Harbor parking lot that are ready for ya. And they’re actually pretty reasonably priced. Bonus: You might see a turtle here too! 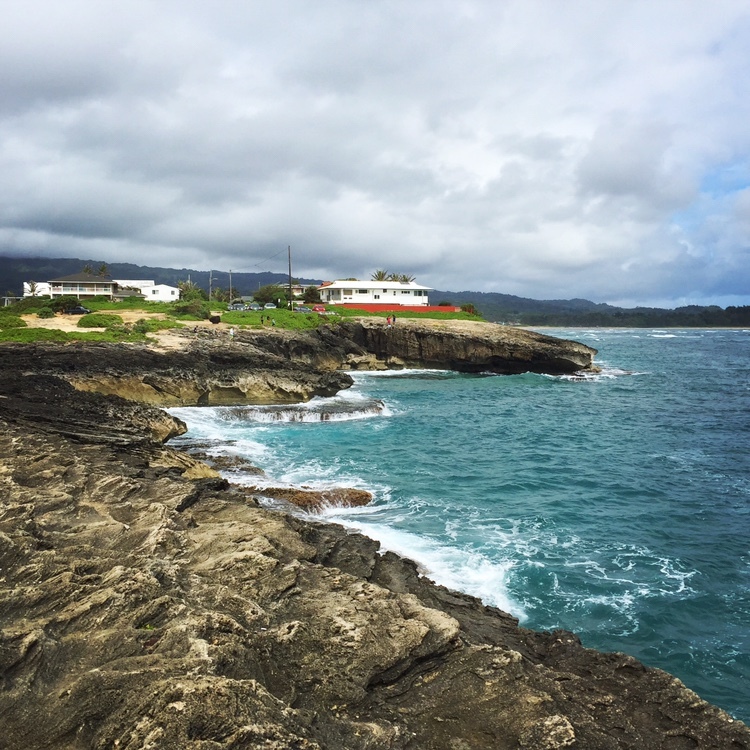 So this isn’t quite a “beach,” but Laie Point had to make it on this list somehow. This rather unheard of spot has some stunning views of crashing waves. If you’re feeling a bit adventurous, locals cliff dive off of the right side of the point (although I would not recommend doing so unless you are a very good swimmer). Also, beware of the waves while you are taking pictures! Nearly every time I go, there is one tourist family that is much too close to the edge, because they don’t understand the power that a single way can have. Want to get another local’s perspective on the best beaches on the North Shore? Check out this post by Aloha with Love! The legal hikes on the North Shore are actually quite scarce, but there are a few. The Kaena Point hike is all the way on the Western point of the North Shore, Oahu. This is the longest hike on the North Shore at 3.5 miles with absolutely no shade. However, it does have a stunning view of the waves crashing on this uninhabited tip of the island. 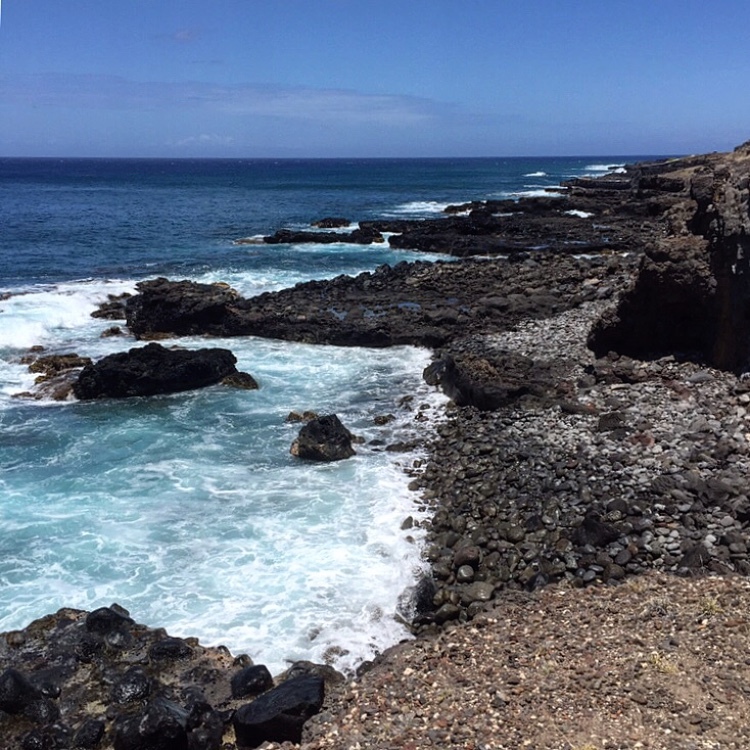 If you’re lucky, you’ll also catch a glimpse of some local birds and Hawaiian monk seals! As I mentioned in my 5 Oahu Waterfall Hikes post, the “hike” to Waimea Falls in Waimea Valley is much more of a walk than a hike. I believe this is the only actively maintained hike on the North Shore. It should take about 30 minutes to walk the three-fourths of a mile to reach the waterfall. Depending on the weather, swimming may be allowed at the falls. If you want to swim under the waterfall, you’re required to wear a life jacket. Because this hike is within the more accessible Waimea Valley area, there are changing areas, showering areas, lifeguards, and parking. This means that this is one of the busiest waterfalls on Oahu as well. 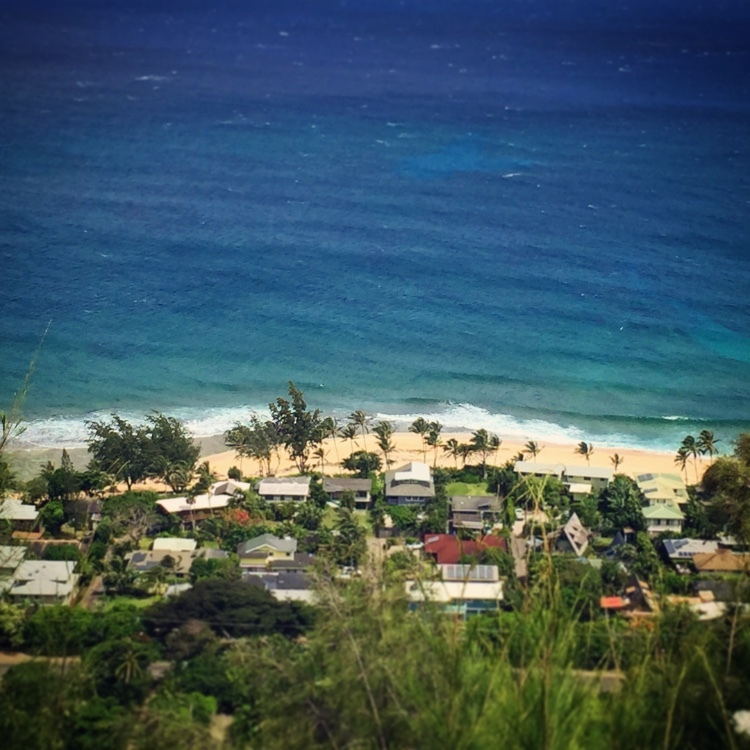 The Ehukai Pillbox hike is my favorite hike on the North Shore, Oahu. It should take only about 45 minutes to reach the first pillbox. From there, you can catch a stunning view of Sunset Beach on the North Shore. For more information on the logistics and the experience of this hike, check out this post dedicated to the Ehukai Pillbox Hike. There aren’t very many shopping areas on the North Shore, but the Haleiwa Shops are an option. This is basically where you can go for any North Shore-specific souvenirs or clothing items. A couple of items you may be familiar with include the HE>i apparel company or the Red Dirt Shirts. The Polynesian Cultural Center is one of the most popular attractions on Oahu. Learn about the many Polynesian cultures by wandering through six Polynesian villages, experiencing a luau, and watching a cultural evening show. The North Shore also has several places where you can cage-dive with sharks. Interested? 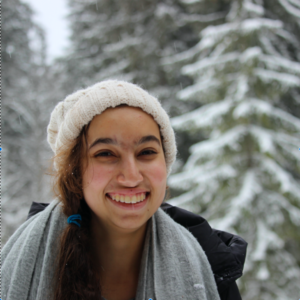 Check out this guest post on it! If you’re feeling extra adventurous, you can skydive at Dillingham Airfield. This is the only place on Oahu where you can skydive, but you have your choice of three different companies. How cool would it be to say that you skydived in Hawaii? Want to see how many of these you can squeeze into one day? Check out the Ultimate North Shore Day Trip! Interested in more Oahu Ultimate Guides? Check out the Ultimate Guide to the Ko Olina Lagoons and the Ultimate Guide to Kapolei! Have you ever been to the North Shore, Oahu? What was your experience like? Tell me about it in the comments (I promise I’ll respond!). Did you think this post was helpful? Pin it for later! My mum is heading here later this week (if the weather holds out) so I’ll have to forward her your post! I didn’t know there was so much hiking and other non-water activities to do. Sounds like a great all-round summer destination! There really are! That’s why I shared this post, so that makes me so happy. I hope your mom will have an amazing time here (assuming this hurricane doesn’t land lol). I have been to Maui and Kauai so far, but I really want to come back and explore some of the other islands. This area looks like it would be right up my alley. Yes! The other islands are definitely worth a visit too, since each island has it’s own unique feel. That shrimp sounds amazing! I’ll be in Waikiki in February for my first visit to Hawaii, is it far away? is a surfing pig tattoo a thing? It’s not too far! It’s about 45 minutes by car :). And lol no, I’d never seen anyone with a surfing pig tattoo until I went to Kono’s, but I thought it was a funny lil tidbit to add. If you need more Hawaii recommendations from a local for your trip in February, snoop around this section of my blog for some ideas :). Do it! Oahu always has more to see and do! (Trust me, I’ve been here for 21 years and still haven’t run out!) Oh, and I totally agree about our pineapple :). Oh what a great post! This looks lovely! Love your foodie recommendations too! Thanks so much for sharing! So glad you enjoyed it! Thanks for reading :). We are actually considering a move to either Maui or Oahu late next year, so this piece will come in quite handy for our research. I cannot wait to try the pineapple softserve. No way!! That’d be so fun! If you’re looking for more local recommendations on the islands, feel free to snoop around the Hawaii section of my blog :). Hopefully it’ll give you more Hawaii adventure inspiration! Hawaii is definitely worth the trip, especially if you’ve read up on some local tips (which you already have!). I am OBSESSED with Oahu. It has been my favorite destination that I have visited. Great post – thanks for sharing! Aw yes! I’m so glad you enjoyed my home island so much! Make it happen again one day! There’s always more to see on Oahu :). Hope my tips help you with your planning! If you’re looking for more of my local tips, check out the Hawaii section of my blog :). Aw that sounds so fun!! Borders & Bucket Lists, thanks! And thanks for sharing your great posts every week! I’m glad you enjoy the posts! Beaches are my favorite places to unwind. I think it’s a perfect place where you want to just read a book, listen to some music or just staring at the noisy waves. To visit all these beaches I would preferrably rent a car. Love your guide! Same!! I feel like I’ll always have to live by an ocean, so I can go to the beach whenever I want lol. Really love to read all these detailed articles about Hawaii, can wait to come one day. Haha sounds good! Hopefully you’ll make it out here soon! It sounds amazing here and the pictures are beautiful. Being able to spot turtles is definitely something I’d love to experience! Come to the North Shore and it’s actually quite easy! Haha it’s actually so easy on the North Shore! I’ve never been to Hawaii, and I always thought I’d choose Maui if I went – but the sand on those beaches might have changed my mind! Maui has some awesome beaches too! Honestly, every island has something special to offer. This post should help you out if you’re still conflicted on which island to visit :). 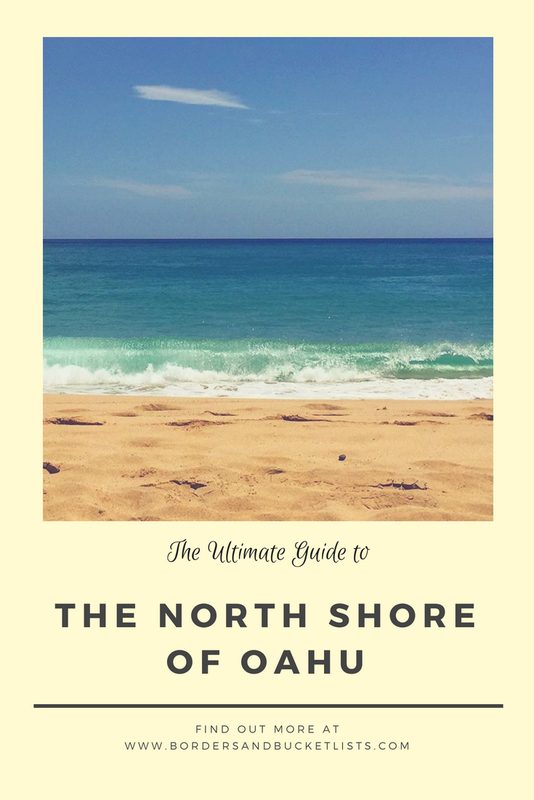 I absolutely loved the North Shore when I was in Oahu, although clearly I wasn’t there long enough to get to see even a handful of your recommendations. I remember being scared to go in more than ankle deep due to the currents! Also, those food reco’s are making my stomach rumble. Thanks for sharing so I know where to go next time. You are so fortunate to have grown up here!! Haha I’m glad you got to visit the North Shore at least! And yeah, the current is very strong along the North Shore – Waimea Bay seems to be one of the few exceptions. Hopefully you’ll be able to check that and some of the food recommendations out the next time you come to visit! Yes! The North Shore is definitely worth a visit :). Yay! Glad to know that my post was helpful :). Haha it’s pretty easy to see one at Laniakea Beach :). Haha yay!! Good to know my local tips are being put to use :)! That banana acai bowl looks AMAZING! 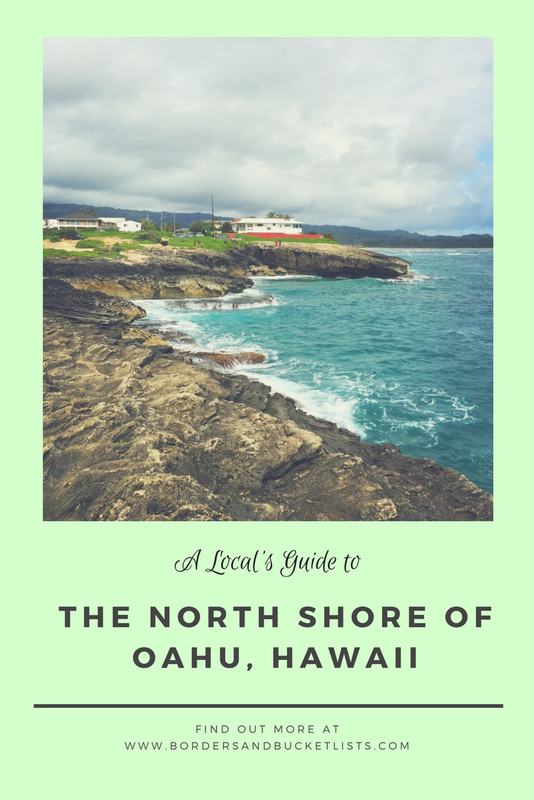 So nice to actually see a guide to Oahu by a local! 🙂 It’s been a while since we’ve visited Oahu (truthfully, we’ve been to Kauai more lately), but I’d forgotten all of the things there are to do on the island. The Kaena Point hike sounds awesome!